Everything you need to know about plastic jars and closures. Can't find the answer you're looking for? Give us a call at 866-93-TARAL (82725)or email us. We're happy to help. Yes. Samples are sent upon request. Multiple samples are sent free of charge by UPS ground anywhere in North America or next day by GSO for California and Nevada only. If expedited air service is required for other areas, please provide a valid UPS or FedEx collect or third-party account number. Currently our minimum order is one (1) full case, however if the total order dollar amount is below $250.00 (excluding any shipping cost) there is a $50.00 small order fee. Orders for stock items are processed and shipped within one (1) business day. How can I tell which cap or lid matches my jar? The same cap size can work with many different sized jars, bottles and containers. For example, a 33mm cap fits our 1/8oz jar, 1/4oz jars, 1/2oz jar, 7/8oz jar, and 1oz jar. Why is the case count for the caps different from the case count for the jars? The same size cap can go on many different size jars, bottles and containers. For example, a 33mm cap can go on our 1/8oz jar, 1/4oz jars, 1/2oz jar, 7/8oz jar and 1oz jar. Are caps included with the jars, or are they sold separately? All products are sold separately due to the various styles of caps and liner options. Do you carry "slip on" lids? What if I want custom colored jars and/or caps? Custom colors are available for both jars and caps but usually require a minimum order of 25,000 units and can take up to 6-8 weeks once color approval has been established and a purchase order has been issued. A Pantone number (PMS#) must be chosen or a color sample must be sent to Taral which will be sent to a colorant house for color match plastic chips to be returned and approved by the customer. Can you print on jars and caps? Yes, we can silk screen print on jars and pad print on caps. The customer will need to provide the necessary artwork by email. Currently we can only print one (1) color in-house. Can you put our label on your jars or the caps we order? We do not provide this service in-house at this time. Yes, your credit card information is secure. We are PCI compliant and use all of the current encrypted software measures. Can I change my method of payment if it is different from my previous order? Yes. You can update your credit card information within your profile by signing in to your account. How do I setup payment terms for my company? Please call or email us and we will send you a credit application. Can I change my order once it's been submitted? We will accommodate changes to orders whenever possible, if within one (1) business day and/or depending upon the type of order or progress of completion of the order. Please call as soon as you can. Yes, all of our products are made of plastic that can be recycled and reused, most of our products have the recycling resin identification logo. What is BPA and does Taral's products contain any BPA? None of the products Taral sells contains BPA so please do not worry. BPA stands for Bisphenol-A and is a carbon-based synthetic compound used to make certain plastics because it is clear and tough. BPA can be found inside of most people bodies because BPA is used in soda cans, canned food, plastic water bottles, cashier receipts, pizza boxes, dental sealants, and various other products we use every day. The good thing is BPA doesn't stay in the body very long, leaving via urine in matter of hours. The FDA and World Health Organization agreed in 2011 that there is not any clear evidence to a ban on the chemical. However, Taral Plastics prefer to be on the safe-side when it comes to our customers and we are proud to offer BPA Free products. What methods of shipping are available? UPS, GSO, and FedEx services are available, both ground and air. Also LTL (Less Than Truckload) and TL (Truckload) are available. We prefer not to ship by US Postal Services due to the increase in complexities, inefficiencies, and hassle. Can I pick up my order? Where? Yes. We accept Will Call orders at any of our five warehouse locations: 725 Zwissig Way, Union City, CA 94587 (main warehouse No. California), 4240-A W 190th Street, Torrance, CA 90504 (So. California warehouse), 1330 Mark Street, Elk Grove Village, IL 60007 (Mid-west warehouse), or 10700 East 51st Avenue, Denver, CO 80239 (Mountain warehouse) and 4233 Janada Street, Haltom City, Texas 76117 (Southwest warehouse). Per our Terms and Conditions, all goods should be thoroughly inspected upon receipt for correctness. All claims for shortages, defects, or other non-conformities shall be made in writing by Buyer within fifteen (15) days after receipt. Failure to do so shall constitute acceptance of the goods or samples and an admission by Buyer that such goods or samples comply fully with terms. Can you ship to Canada or other countries? Yes, we ship internationally. Customer is responsible for a Freight Forwarder for customs clearance and any duties or fees your country may impose. What if the product for my order is not in stock? Contact our Customer Service department at 866.93.TARAL(82725) for more information on when stock will become available. A minimum order quantity may be required. Do you offer discounted pricing? Yes, the more you buy, the lower the unit price. Price breaks usually start at 5,000 10,000 25,000 50,000 100,000 250,000+ units. Please note that volume discounts do not apply to official container distributors. Not at this time. Usually HDPE or LDPE containers are blow molded. 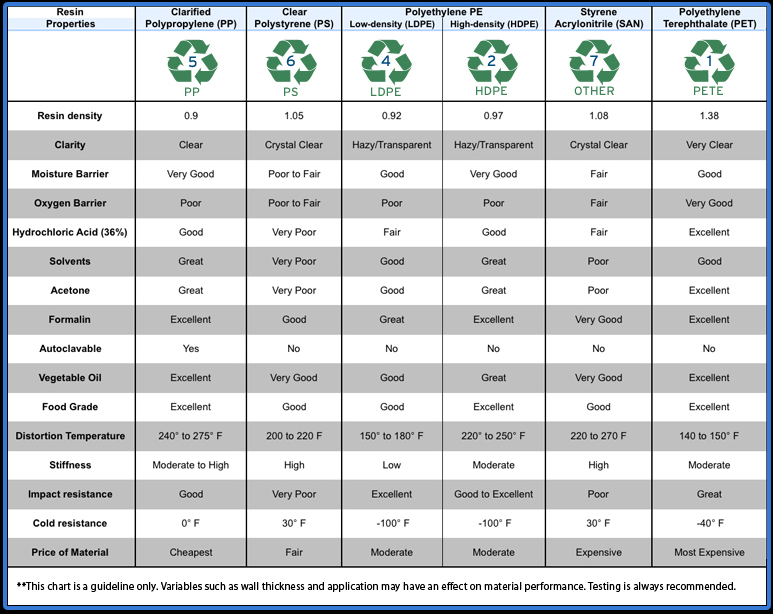 HDPE or LDPE typically cost slightly more than Polypropylene and offer little to no advantages..
What are the different styles of jars? These straight-sided, wide-mouth plastic jars range from 1/8 ounce to 32 ounces of capacity, and are usually the least expensive and most economical of the three jar types. They're used for everything from car polish, to glitter, leg wax, and pasta sauce. Basically a "jar within a jar", these strong containers are configured from two distinct parts to give you the flush look of a thick wall plastic jar but at a fraction of the cost. Widely used for lotions, creams, and hair care products. The heaviest of all jars ranging from 1/8 ounce to 12 ounce capacity. These thicker wall plastic jars are molded from a single piece of plastic for extra durability and to allow the side of the closure to run flush and even with the sides of the jar. Perfect for beauty, cosmetic and personal care products. What types of plastics used in jars? Crystal clear, similar to clarity of glass. Regular (Single) Wall Jars and Thick Wall Jars are made of this plastic. Cosmetic, Arts & Crafts, Nail Salon products and Smoke Shops commonly select this plastic type for packaging. Translucent, slight haze, see through both walls of the jar, great contact transparency. Regular (Single) Wall Jars, Thick Wall Jars, Double Wall Jars, Caps and Closures are made of this plastic. Can be used for food packaging. Similar to Clarified Polypropylene but does not quite have the impact and its color is hazy similar to a plastic milk jug. Exactly the same as Cloudy Natural PolyPropylene except for color is an Opaque White. The same appearance as Clear PolyStyrene (CPS) resin but with slightly more chemical resistance. Excellent chemical resistance, excellent clarity, excellent impact strength, and excellent oxygen barriers.?? The most expensive of the commonly used resins. Food, essential oils, beverage and liquid items can be packaged with this plastic. 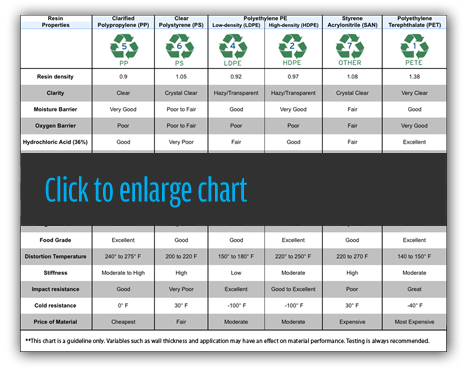 The best plastic for any application with regards to chemical resistance, impact strength. Can NEVER be clear or transparent. Natural PolyEthylene is very milky and hazy in color. HDPE has been used for items such as motor oil or lotion packaging. LDPE has been used for food packaging. What types of plastics are used in jars? Polystyrene resin is available in Clear (GPS) color, which gives a glass-like look. Polypropylene comes with a Natural Clarified (NPPC) color, which is transparent with a milky shade to it. If the customer uses silk screening, Polystyrene is the primary choice. Polypropylene can also be used if special inks are applied when screening. For offset printing and Polystyrene label application, it is recommended to use Polypropylene jars. Each customer must perform their own testing of all packaging components to ensure compatibility. Contact Taral to receive jar samples free of charge. What are the different jar sizes? Jar sizes are identified by ounces (oz) and millimeters (mm). The diameter across the opening of the jar (from outside thread to opposite outside thread). The total fluid ounces (in volume) of a product that can be contained within a jar when filled to the bottom of the jar's neck threads. For example: a 16oz 89mm jar holds 16 fluid ounces (in volume). Note that this jar may hold more than 16 fluid ounces if the jar is filled to the very top and/or the product has a greater density than water. A jar's millimeter size determines the size of the coordinating closure (cap). Therefore, a 16oz 89mm jar requires a 89mm closure. What are the different styles of closures/caps? A cap that contains a circular plastic "liner" within the cap. Flat smooth or matted top with a ribbed, lined texture on the side of the cap. A dome shaped cap that presents a flat smooth top with a smooth textured yet curved side. What types of plastics used in closures? Primarily caps/closures are made from Polypropylene resin. What are liners and do I need one? A liner is a circular plastic/foil item that goes inside of a cap. When a cap is applied on a jar, the liner performs as a seal for the jar, pending the design. A liner protects the packaged content from outer contamination. The selection of a liner type depends on the product to be packaged and the container's plastic material. 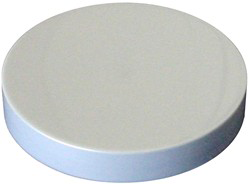 White Polyethylene (PE) foam disks that remain inside of the cap at all times. These liners are non-adhesive, however they minimize the air travel from outside the jar to the product inside of the jar. Adhesive and stick to the top of the container when the cap is first screwed on for tamper evidence. Pressure sensitive liners do not guaranteed to work every time and do not provide the quality of seal achieved with a foil/heat seal liner. There are numerous different configurations of heat seal liners. Used in conjunction with a heat induction machine to adhere the foil seal to the container. This type of liner is often found on vitamin jars, peanut butter jars, and salad dressing bottles. Which closures are commonly used with which jars? Any cap can be used with any jar (pending the diameter of the cap available matches the width of the jar mouth), however below are examples of cap types that are commonly selected with each jar type. Ribbed side/Matte top cap or Ribbed side/Smooth top cap. This combination creates an industrial look. Smooth side/Smooth top cap. This combination is often used in the following industries: food, craft and hobby, personal care and cosmetic. This combination is often used in the personal care and cosmetic industries. Dome caps are commonly used, which provide a unique round corner look. The personal care and cosmetic industries often use this combination. Smooth side/Smooth top caps and Dome caps are commonly used. This combination is often used for high end personal care and cosmetic packaging.